DaVinci Gourmet all natural flavoring syrups, like this almond syrup, are naturally delicious, providing consistent quality flavor without the artificial flavors, colors, or preservatives! Made with pure cane sugar, this flavoring syrup is perfect for sweet drinks like granitas, Italian sodas, and smoothies. Since it is shelf stable, you can proudly display this all-natural product along your bar or counter. Featuring the flavor of fresh California almonds, this almond flavoring syrup enhances the aroma and taste of any drink or dish without imparting any artificial color. Use this syrup to create one-of-a-kind almond flavored lattes or blend it with iced coffee and milk for almond frappes. It can even be mixed with chocolate, banana, or other fruits for indulgent dessert drinks like chocolate almond flavored milkshakes. Try using it with other ingredients as a quick and easy way to enhance cooking or baking recipes. One splash of flavoring syrup goes a long way, and flavored beverages made from this flavoring syrup enhance your menu with new and appealing, all-natural items! This user-friendly plastic bottle is easy for your baristas and restaurant staff to handle. Sold in gourmet coffee shops, specialty food stores, food service outlets, and grocery stores, DaVinci Gourmet products, like this all-natural almond syrup, have a long history of commitment to quality and superior taste. The DaVinci almond flavoring is great and very fresh tasting. A perfect way to enhance the flavor of our cocktails especially our Amaretto sour slushies. 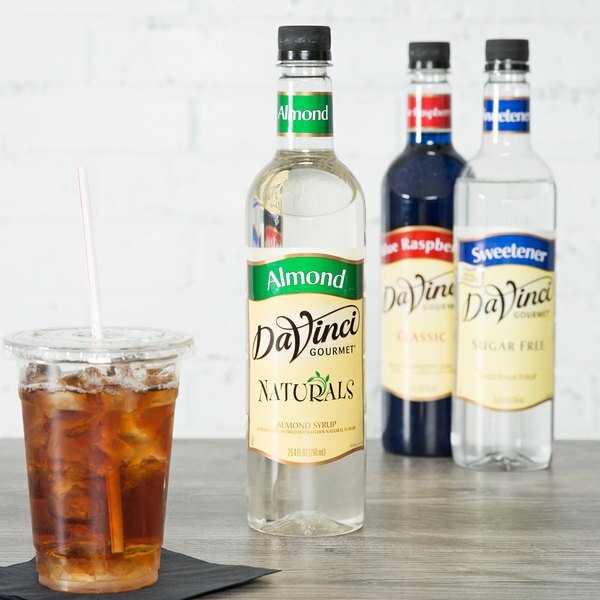 The DaVinchi almond syrup adds a bold flavor to coffee drinks. A light amount will prevent the almond syrup from overpowering your drink. Paired with a bolder brew a slightly higher amount can be used. I absolutely love this stuff. 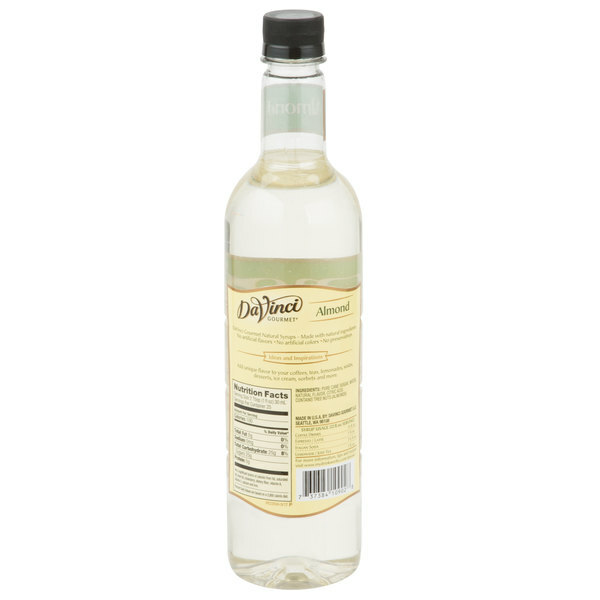 It is easily the best and most flavorful syrup that DaVinci currently makes. I use it so much now and I just ordered 4 more bottles because of how good it is. Love this all natural coffee flavoring syrup. It is great for adding to our dessert sauces and really tastes like fresh brewed coffee. Love the clear syrup as well. A great almond flavoring for coffee that is delicious and very rich. The syrup makes a delightful latte and really blends well with espresso for a wonderful treat. I am a huge fan of almond flavoring and almond syrups. This is great to drizzle on deserts or just use in your coffee or hot chocolate. This is a winner. Nothing beats the great, sweet smell of Almond flavoring syrup. It is so rich and divine that I can not get enough of it. I add it to my coffee and frostings for a great kick of flavor. 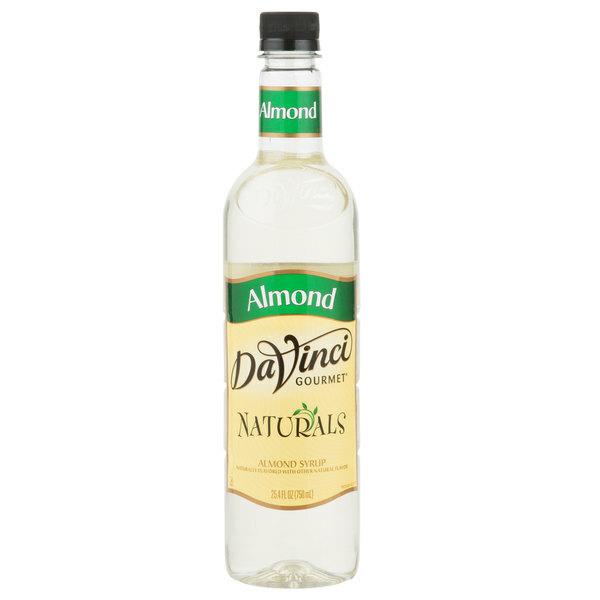 The DaVinici Almond coffee syrup is a very versatile product. We use it to flavor our macchiato an cappuccinos, but we also use to flavor our wedding cake scones. A very good flavor with an amazing aroma. Excellent Product! Adds a fresh almond flavor to hot and cold drinks. As well as baked goods, frosting, and icing. A quality flavored syrup at a reasonable price. DaVinci's syrups are great quality and produce a consistent flavor. This almond syrup is no different. It's great for coffee drinks: lattes, frappes, etc. Great buy! DaVinci Gourmet is now the only syrup I will buy. The flavor is strong enough that you don't have to use much, but also well-rounded. Doesn't have a bitter or chemical aftertaste. Gives a premium finish to coffee and steamers, and works well for almond liqueur in mocktails. The delicious almond flavor in this syrup is perfect. It doesn't have any fake flavor to it, it is exactly what I was looking for.